Recently I've posted about two English artists who specialized in "needle painting," Mary Linwood and Mary Morris Knowles. We know a fair amount about both of those women: Linwood exhibited her own work and had something of an international reputation, while Knowles was a writer and anti-slavery activist as well as an artist. Much less is known about Margaret Ansell, like Linwood and Knowles an artist whose medium was needle and thread. Along with Mary Linwood and six other female artists, Margaret Ansell was included in the 1776 Society of Artists of Great Britain's exhibition in London. Something of the attitude toward their work is indicated by the exhibition catalog: they were considered "honorary exhibitors." 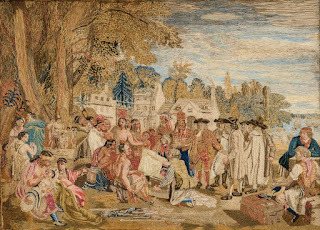 Ansell's pieces for the 1776 exhibition included needlework renderings of two paintings by Benjamin West, The Death of General Wolfe (oil painting, 1770) and Penn's Treaty with the Indians (oil painting, 1771-72). 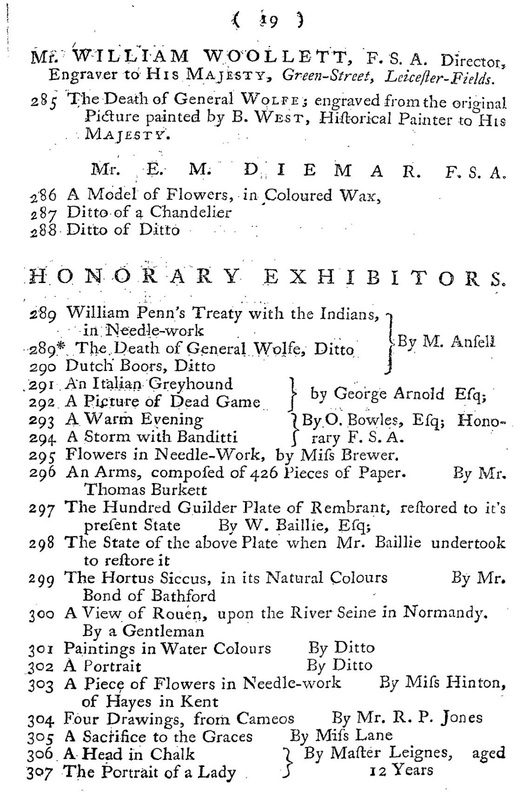 * Interestingly, as Lea C. Lane notes, "Engraved versions of both West paintings rendered by Ansell also appear in the 1776 Society of Artists exhibition, but [the artists] are given full billing (i.e., not [listed as] honorary exhibitors)." In her analysis of Ansell's work, Lane adds one further intriguing possibility. 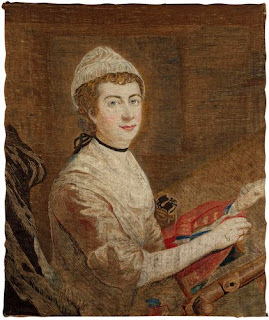 The final exhibition of the Society of Artists occurred in 1791, and its catalog includes a "Mrs. R," who saw twelve of her needlework pieces exhibited. ** In Lane's estimation, these works are "startlingly similar to those shown by Margaret Ansell." 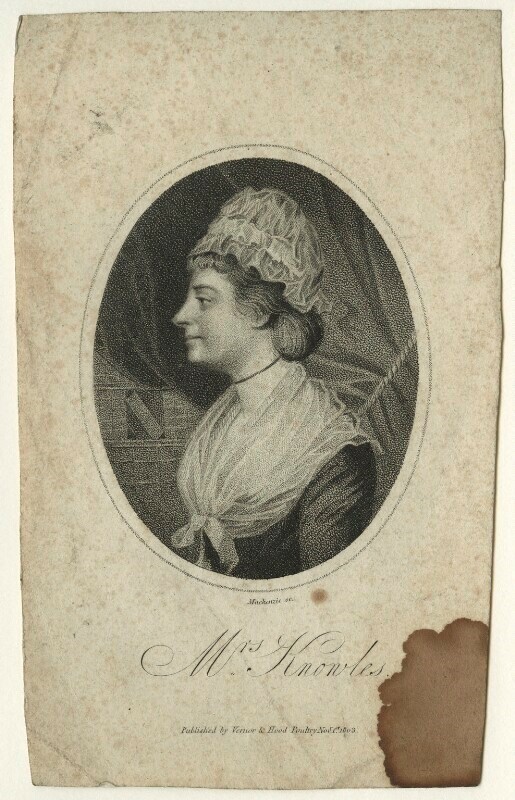 Lane has also discovered that a woman named Margaret Ansell, a spinster from Tottenham, married a man named James Roberts in 1781: "Perhaps the 1782 sale of the 'late Miss Ansell’s' property only marked the close of one chapter of her life, but not the end of her participation in the evolving landscape of public art in London." Lane's 2017 essay on Ansell, "Freak Pictures: The Needlework Paintings of Margaret Ansell," represents research conducted after a piece of embroidery work was donated to the Winterthur Museum. The piece proved to be Ansell's Penn's Treaty with the Indians. *The catalogue also indicates Ansell exhibited a piece titled "Dutch Boors"--likely based on one of David Teniers's paintings of peasant life. According to a "complete dictionary of contributors" to the Society of Artists of Great Britain, "M. Ansell, Needle Worker" also exhibited a third piece, a "Dutch Landscape; from Teniers." 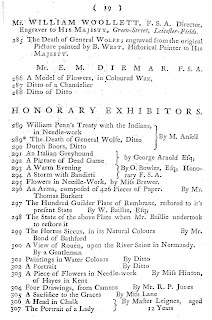 This list of contributors and their work also identifies the M. Ansell who exhibited in 1776 as "at the Boarding School, Tottenham." 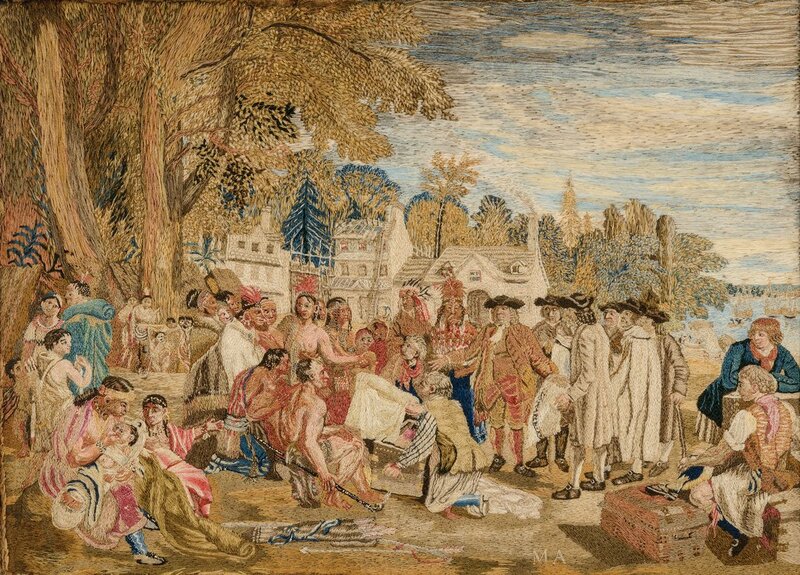 **Interestingly, the dictionary of contributors to the Society of Artists of Great Britain also notes that "M. Ansell" contributed two needlework paintings to the 1780 exhibition, "Dead Game" and "A Bird."